The Arts Centre Melbourne is a performing arts complex on Melbournes Southbank. 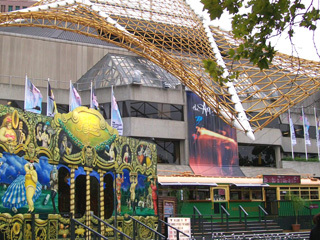 It hosts major Melbourne performances - Opera Australia, the Australian Ballet, the Melbourne Theatre Company and Melbourne Symphony Orchestra, as well as a host of Australian and international productions  and the famous Spiegeltent. 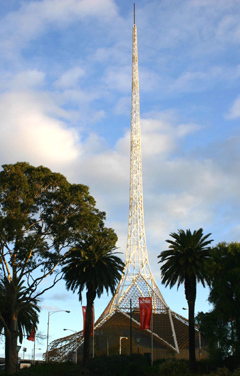 It was designed and built, together with the National Gallery of Victoria, in the 1960-80s, and includes the Hamer Hall and the Theatres Building, which is crowned by the famous Melbourne Spire, and listed on the Victorian Heritage Register. 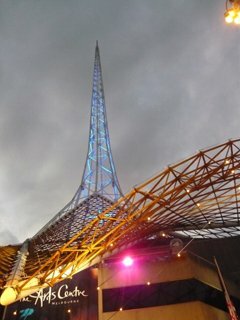 The Arts Centre Melbourne has gained landmark status because of its whimsical steel spire that wraps around the Theatres Building. You can see it from Federation Square and along the Yarra. The original 115m spire had to be replaced in the mid-1990s because of deterioration. The new spire is higher, with 162 metres. It is still based on the original design and retains its 1970s feel. It is illuminated with roughly 6,600 metres of optic fibre tubing, 150 metres of neon tubing on the mast and 14,000 incandescent lamps on the spire's skirt. Its metal webbing is influenced by the billowing of a ballerina's tutu and the Eiffel Tower. The Hamer Hall is named after Rupert Hamer as Minister of the Arts (and Premier) in the 1970s (not the comedian Wendy Harmer). The Playhouse is located in the Theatres Building under the Spire and has an impressive collection of aboriginal artworks in its foyer. It is a performance space specifically designed for drama, but can also accommodate an orchestra for dance, musical comedy and chamber opera. It seats up to 884 people. The State Theatre, also in the Theatres Building, features leading dance and Broadway musicals, ballet and grand opera productions. It seats 2,085 and has one of the largest stages in the world. Its amazing ceiling is decorated with 75,000 tiny brass domes! The Fairfax Studio is an intimate 376-seat drama space, also located in the Theatres Building. 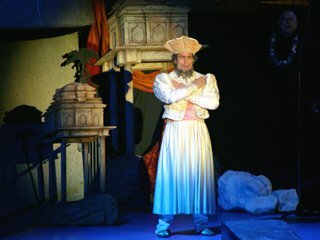 It is featuring the work of the Melbourne Theatre Company and a variety of smaller contemporary Victorian productions. The Arts Centre Melbourne also contains galleries and a huge Performing Arts Collection, with over 400,000 items relating to the history of circus, dance, music, opera and theatre in Australia and of Australian performers overseas. The Sidney Myer Music Bowl in the Kings Domain Gardens is an Arts Centre outdoor venue. It hosts Carols by Candlelight, the Melbourne Symphony Orchestra's free summer series, as well as a series of concerts and performances throughout the year. A Spiegeltent is a European Mirror Tent - used as cabaret and music salon. The Melbourne Spiegeltent, with an arrangement of themed outdoor spaces, is another Arts Centre Melbourne venue, and a much-loved summer feature of the Arts Centre forecourt. It features cutting-edge cabaret, music, comedy and circus performances. Spiegeltents are early 20th century hand-hewn pavilions, used as travelling dance halls, bars and entertainment salons. They are built of wood, mirrors, canvas, leaded glass and detailed in velvet and brocade - each with its own personality and style. A Spiegeltent is the very essence of a festival club, kabaret salon and intimate concert hall. Marlene Dietrich sang Falling In love Again on the Famous Spiegeltent stage in the 1930s. Dont miss it! There are only a hand-full of these unique and legendary tents of mirrors left in the world today. Check here for Arts Centre Programs.